We had one goal to accomplish today. On the cruise last night, one of the shipmates had mentioned boogie boarding to the boys. 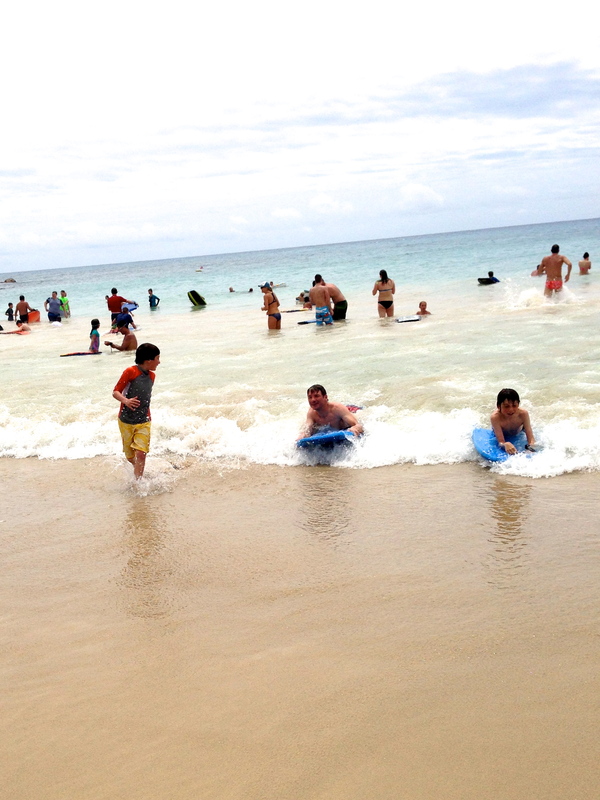 He recommended Brennecke Beach, directly adjacent to Poipu Beach Park, which is locally known as the place for boogie boarding. Because it’s a small beach, no surfboards are allowed and people are left to enjoy the waves either by body surfing or boogie boarding. So this morning we suited up, grabbed our towels and beach mats, and headed to the Poipu area hoping to escape the rain in Lihue. It worked. By the time we got to Poipu it was obvious we were in for a sunny Hawaiian morning. My first order of business, though, was to do some more snorkeling. The first day we were here, we’d hit Walmart to purchase an inexpensive underwater camera, a camera we had managed to leave at the condo our first snorkeling day at Poipu and then not truly understand how to use during our second snorkeling day at Anini Beach when I swam with the sea turtle. I was determined not to let our purchase go to waste. 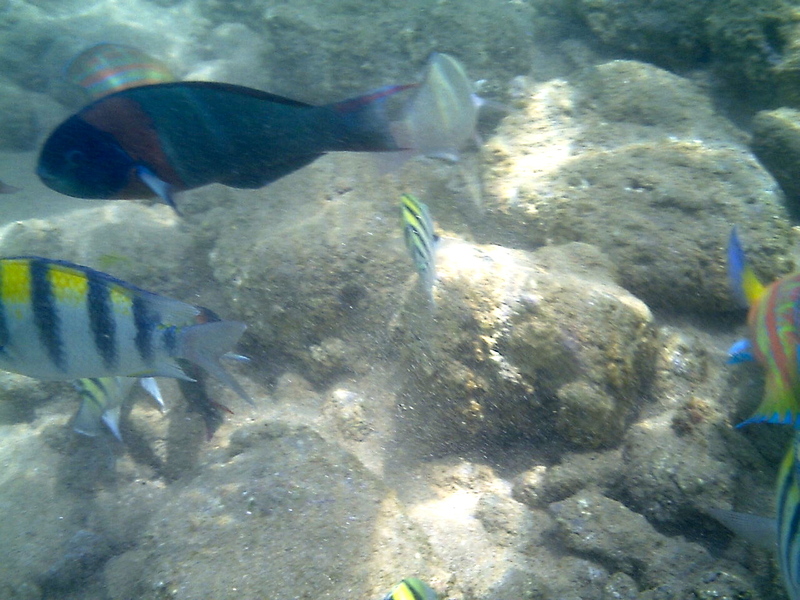 Knowing I had seen great fish at Poipu before, I knew today would be my day. Armed with snorkel, fins, and mask, I approached the water with that camera wrapped firmly around my wrist, a woman on a mission. In a matter of minutes I was underwater snapping photos of any fish that would get within arm’s reach. If you’ve ever used an underwater camera, you know that underwater photography is not easy. You mostly aim your camera in the direction of the fish and then pray that you’re actually photographing the subject you’re intending to capture. I had no idea if it was working, but I snapped away like a loon anyway. Imagine my joy when I actually had captured a few shots of actual fish and not just my thumb over the lens or my own, neon-pink fins. Meanwhile, Steve and the boys ran across the street to procure boogie boards. When they had returned, we walked next door to Brennecke Beach so the boys could try it out. I knew they would love it, and they did. Joe, who had left his rash guard at the beach yesterday for some other nice family to inherit, was getting mighty beat up on his skinny little boy chest but he could not bring himself to care. He loved it. Luke liked it too, but not as much as Joe, so he kindly shared his board with his crazy parents who had some fun too. Eventually, when we were all tired of being bounced around, we packed it in. We shared our battle scars, sandburned knees and bruises from collisions in the crowded surf, and headed to Koloa for some snacks and shopping before heading home to clean up for the second part of our day. Just before leaving as we stood at the park surveying the scene we saw two whales breach in the distance, their behemoth bodies launching halfway out of the water before landing with an enormous splash. They looked as triumphant as we felt. When we finally were ready to head back out, we ran into more rain. 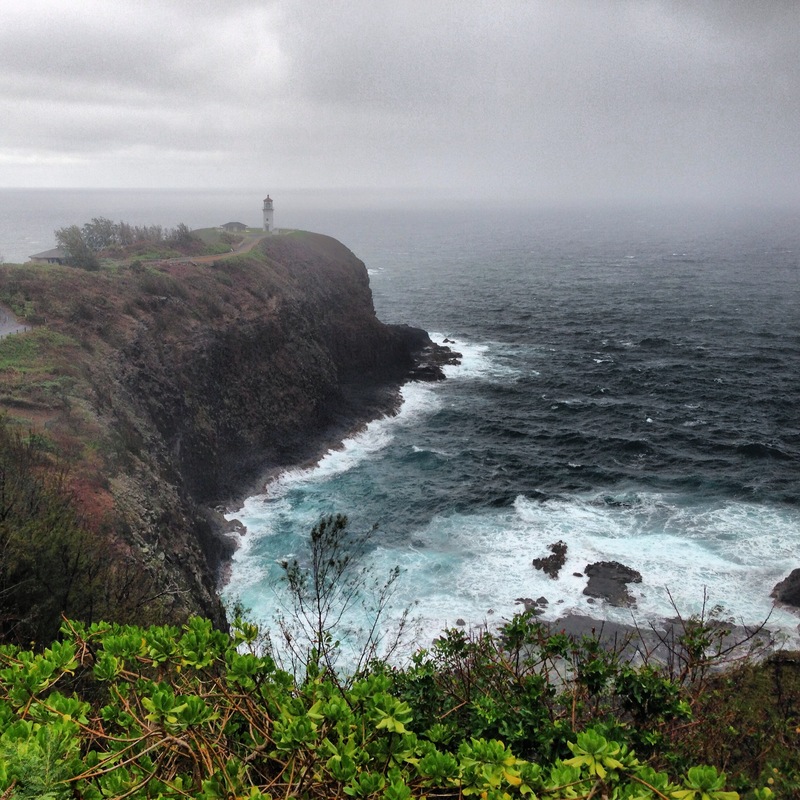 It was pouring a steady, strong rain from Lihue through Wailua and Kapa’a, so we kept on driving. We’d originally thought we might make it as far as the north shore. Instead, we stopped off for a quick view of the Kilauea Lighthouse before heading off in search of dinner. The lighthouse and bird sanctuary were closed for the evening, but we caught a peek of the lighthouse from the overlook. The rain let up just long enough for me to snap a few quick photos of it. We might have to head back there tomorrow. We allowed ourselves an early evening tonight because we’ll be getting up early to make the most of our last full day here on Kauai tomorrow. We have a lot to pack into our day. I would like to see another beach or two and snorkel again. Joe is still in need of his vacation souvenir, so he would like to shop. 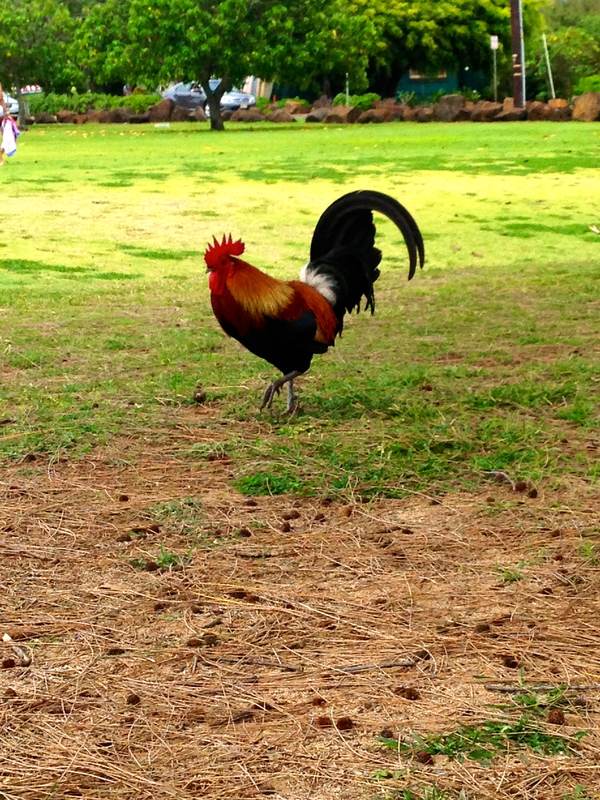 Luke is determined to catch a Kauai chicken or rooster, as we told him on day one that we would award anyone who could catch one $40 for their effort. And Steve found one more shave ice shack he has to try. I’m beyond sad to be heading home soon. Although it will be nice to sleep in our own house, there’s no doubt I’m going to miss this place. Steve told me today that I’d better hurry up and find my get-rich-quick scheme because we’ll need to some serious cash for the home I want to have on this small, idyllic, crazy chicken paradise out in the middle of the Pacific. There’s an easy Photoshop filter to enhance the colors. Get with me when you get back.